We were camping in Eastern Oregon the night before a raft trip near the put in for Hells Canyon. It was a popular campsite and I noticed a young man with a striking tendency to put his hand to his ear in normal (non electronic) interactions as if he were talking on his cell phone. A naturalist notices these things. We humans are visual creatures. We see colors. We distinguish between ripe and unripe fruit without bothering to taste it. Our eyes guide our fingers to the ripe fruit bobbing from the wind or our disturbance of the branches. We are mesmerized by dancing colors. In the early 1950’s black and white television became color television. Millions of Naked Apes who before engaged their social skills began to watch the virtual dancing fruit. 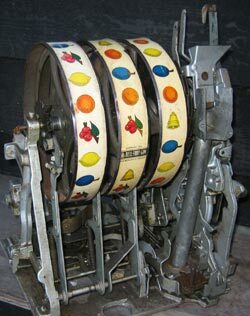 Before that there were mechanical slot machines. Pretty much about the fruit, no? And so it is that we all carry virtual fruit trees in our pockets and are compelled to consult them as if our next meal depended on them, which it might, in a virtual kind of way. We taste the apple any way we can. It is our heritage. This entry was posted in Anthropology, Biology, History of Life, Metaphor, PDA and the Apple of Eden, River and tagged BlackBerry, Fruit, IPhone, Mobile phone, Personal digital assistant, Slot machine. Bookmark the permalink.